Sara-Kate Connolly is in fifth grade for the second time, and everyone, including fourth graders, like Hillary, knows to stay away from her. Her house is dark and dilapidated, and the yard is overgrown with brush. Plus, Mrs. Connolly never comes out of the house. It’s not safe to play at the Connollys’ house, and Hillary’s mom would prefer that she didn’t. The only thing is, Sara-Kate has an elf village in her backyard. She invites Hillary over to help her maintain it, and from that first afternoon Hillary is hooked - not just on elves, but on Sara-Kate herself. As their friendship grows, Hillary becomes convinced that Sara-Kate herself might be an elf. She also learns, over time, and quite by accident, the horrible truth of Sara-Kate’s sad and mysterious life. This is one of the creepiest children’s books I have ever read. I am so thankful I did not discover it when I was a kid, because I’m not sure I could have handled its eerie tone and unresolved ending. Though this is a realistic fiction book, it’s also something of a psychological thriller. Hillary believes in Sara-Kate’s well-constructed fantasy so thoroughly that she becomes almost blind to the fact that Sara-Kate and her mother are nearly starving to death. 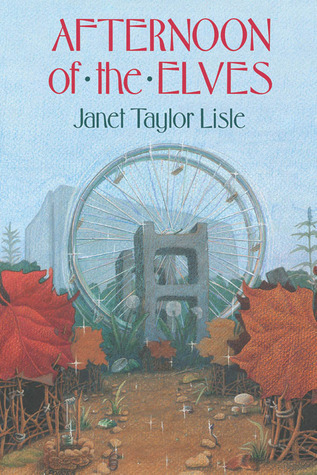 She becomes obsessed with the elves to the point that she continues visiting them after Sara-Kate is gone, and she becomes distant from her own friends and rebellious towards her mother. Sara-Kate’s house is described using details one would attribute to a haunted house, and a little shiver of fear and anticipation went up my spine each time Hillary thought she saw Sara-Kate’s mom appear in the window. When Hillary finally makes her way into that house and sees the state of things inside, I felt like I was watching a horror movie, just waiting for something to jump right out at me. I wouldn’t say I enjoyed it - the whole story actually really freaked me out. This book was published in 1989, and received a Newbery Honor in 1990, but though it is more than 20 years old, it reads as though it could happen any time. Despite it creepiness, the story does raise a lot of important issues that seem relevant to almost any time period. It shows the way poor families, or families in need of serious help, can sometimes fall through the cracks. It questions whether the help given to such families is adequate or truly helpful. It shows the ways in which traumatized children can cope through fantasies, and even helps Hillary to become her own person, in a very weird way. What makes the book so unsettling is that nothing is neatly resolved. The reader is left to grapple with difficult questions on her own, and to come to her own conclusions, whatever they may be. Kids can read this book on their own, but I think this is one of those stories that really needs to be shared and discussed so kids can process what they have read. After finishing the book, I didn’t even want to walk around my own house in the dark. It’s that kind of disturbing and eye-opening story, and I think kids who read it will have a lot of their own questions and worried thoughts upon finishing it. It’s a beautifully written novel, and in some ways quite similar to my favorite book by E.L. Konigsburg, Jennifer, Hecate, Macbeth, William McKinley, and Me, Elizabeth, but a feel-good beach read it is not. Recommend it to those strong upper elementary readers looking for a challenge, and to fans of horror stories. Also check out this discussion between the author and a group of students, formerly at her website, and now at Internet Archive, which sheds at least a little bit of light on the story.